Looking for a romantic gift this Valentine's Day? Perhaps this meteorite that rained hell on Siberia in 1947 is for you. Valentine's Day is hurtling toward us again like so much extraterrestrial debris — and, to celebrate, the venerable Christie's auction house is selling off a heart-shaped meteorite than rained hell on Siberia several decades ago. Part of the rock's astronomical starting bid comes from its backstory. According to the Christie's website, the meteorite was one of hundreds of shards that splintered off a 200,000-pound chunk of pure iron (90,000 kilograms) and rained down over the Sikhote-Alin Mountains in Siberia in February, 1947. When these fragments finally crashed into the mountains, the resulting shockwaves shattered windows, collapsed chimneys, toppled trees and roared with sonic booms that were audible hundreds of miles away. It was very romantic. 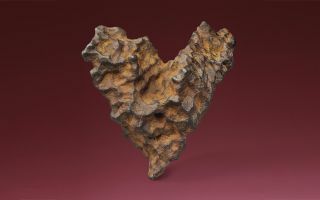 While many of the meteorite fragments found after the incident are jagged, shrapnel-like lumps, the Heart of Space likely broke off its parent meteor higher up in the atmosphere and was subsequently carved into a more aerodynamic shape as it rocketed toward the ground at tens of thousands of miles an hour, according to Christie's. If this little piece of flaming space chaos is too rich for your blood, other lots in the auction include rare meteorites flecked with extraterrestrial gemstones (known as pallasites), meteorites that got catapulted off of the moon and landed on Earth, and a slice of the 15-ton (13.6 metric tonne) Willamette meteorite — a fixture of the American Museum of Natural History and "the most famous meteorite in the world," according to Christie's. Whether you can bring one of these celebrity stones home or not, we hope your Valentine's Day rocks.